Ceviche is popular Latin America dish where raw fish "cooks" in lime juice. This easy dish is best made in advance (at least 2 hours, but even better overnight) and can last about three days in the refrigerator as it only gets better as it marinates. Peruvians refer to this marinating juice as Leche del Tigre and often drink it up for its tasty shrimp-lime flavor. 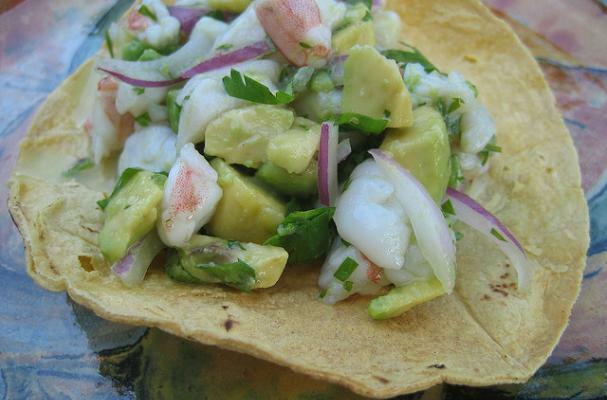 Ceviche is perfect for a warm weather al fresco dinner or a lovely lunch in the sun. It's also delicious alongside a chilled gazpacho. Remove the heads (if there are any) from shrimp, then peel and devein. Cut into 1/2-inch pieces and place in a large glass bowl. Add the lime juice and a pinch of salt and stir to incorporate. Cover and refrigerate for at least 2 hours (best overnight), stirring occasionally. When ready to serve, add onion, chile, cilantro and avocado. Serve with fresh toasted corn tortillas.